This is a selection of online and print newspaper articles and radio broadcasts covering the campaign against the abuse of horses and donkeys in Israel. Het trekken van overbelaste karren door trekpaarden en ezels in Israël straks verleden tijd!! They Save Horses, Don't They? 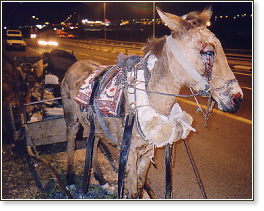 These articles cover some of the horrible abuses of horses and donkeys on the streets of Israel. In the Ha'aretz article (below), the municipal vet of Tel Aviv-Jaffa, Dr. Zvi Galin, proposes a new and entirely unacceptable alternative: using these horses to pull carriages. Instead of solving the distress of the horses and donkeys who are exploited in various ways, City Hall intends to offer the horse owners the option of using their horses to pull carriages for tourists. This plan is promoted in spite of the fact that during the last few years major cities all over the world have banned, or are working toward banning, the use of horses for pulling carriages, in light of animal welfare considerations. Dr. Galin concludes by saying that he would like to show that there is a proper way to raise horses and take care of them. Hakol Chai believes that "a proper way" to care for horses and donkeys cannot coexist with their exploitation. The use of horses and donkeys for "tourist" purposes instead of for "alte zachen" changes nothing in this respect. "This afternoon, at the entrance to the Tel Aviv Council meeting, Hakol Chai conducted a protest demonstration against the municipality's disregard of the continuous abuse of horses and donkeys in the city. The purpose of this activity was to make it clear to the City Council members, who were discussing this issue today, that the plight of horses and donkeys must not be ignored." "Hakol Chai, which began the campaign against cart horses years ago, made it clear that it will follow the implementation of the proposal and will continue to do everything to uproot this cruel phenomenon from Tel Aviv-Jaffa and from any other place where it exists." Arutz Sheva – Israel National News is the online edition of the Israel Broadcasting Network. Arutz Sheva articles © IsraelNationalNews. CNBC.com is the online edition of CNBC. CNBC.com articles © CNBC, Inc.
Haaretz is the online edition of Haaretz. Haaretz articles © Haaretz. The Jerusalem Post articles © Jerusalem Post. Kol Israel Radio © 2009 Israel Broadcasting Authority. Nana is the online portal of NetVision. Nana articles © NetVision Ltd.
nrg is the online edition of Ma'ariv. nrg articles © nrg. Walla! is an Israeli internet news portal. Walla!Green articles © Walla.